CBS Sports is once again teaming up with the United States Basketball Writers Association and its Wayman Tisdale Freshman of the Year Award. Every Tuesday we announce a national Freshman of the Week winner in addition to our Frosh Watch, which is a ranking of the top 10 most statistically impressive freshmen in men's Division I college basketball. What do you want us to do? It's Williamson again, and there's no one with a real case against him. Since last week's Frosh Watch, Williamson played three games, averaging 24.3 points, 7.7 rebounds, 3.7 assists, 2.7 blocks, 1.7 steals and only 1.3 turnovers. Duke defeated Pittsburgh, Georgia Tech and Notre Dame, two of those three coming on the road. Williamson was on the floor for an average of 33.6 minutes in those three games and shot a ridiculous 81.1 percent (30 for 37), which includes 2-of-5 3-point shooting. We need to shake ourselves from being numbed by the numbers. Williamson is so efficient, he's making the aberrational seem routine. He's shooting 75.1 percent from 2-point range this season, which is by far the best among all players who've taken at least 150 attempts; Gonzaga's Brandon Clarke is closest in that realm, at 70.4 percent on 196 attempts. Williamson's making three-fourths of his shots from inside the 3-point line -- and he's take 213 of them. His performance on both sides of the ball last week easily earned him his third Freshman of the Week honor. He's now one away from matching Trae Young's single-season record. These are the top 10 freshman performers in college basketball. For all of the deserving pub Tre Jones gets for being an outstanding defender, Williamson still seems like the best on that end of the floor for Duke. He's one of the only players in college basketball who can truly and effectively guard all five positions. He displayed again on Monday night how adroit he is in handling an opposing point guard. RJ Barrett made all three of his chances to shine this week count, as Duke went 3-0 with two crucial road wins. During that span, Barrett averaged 22.3 points, 8.3 rebounds and 1.3 steals per game to further validate his standing as the clear-cut No. 2 among all college freshmen. He continues to take a high volume of shots for Duke -- according to KenPom, he takes 35.2 percent of attempts available when he's on the court, ranking 12th in the country among all players -- but he's still doing so at a relatively efficient clip. And most importantly, Duke keeps winning; the Blue Devils are 18-2 after dismantling Notre Dame on Monday night. Antoine Davis missed his first game of the season on Saturday against IUPUI with an undisclosed injury, but he made a strong statement in his lone game this past week by dropping 28 points and knocking down 5-of-7 attempts from beyond the arc. Davis this season is now shooting an effectual 41 percent from the 3-point line and 42.2 percent from the floor, all while recording a usage rate of 36.6, ranking him fourth among all college players. Romeo, Romeo, you've been great, but wherefore hath thou team's season gone? With Langford experiencing a turbulent month overall, Indiana has taken a nosedive in the Big Ten with six straight losses. 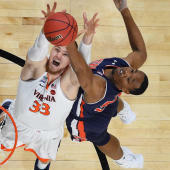 He's still been solid overall this season and shown everything NBA scouts will love about him at the next level -- his size and physical profile is perfectly projectable, as is his defensive versatility and scoring instincts -- but he's dropping a bit in our Frosh Watch because he's been up and down. He's just 22-of-60 from the floor shooting in his last five games, and 3-of-16 from the 3. As we look around college hoops this season, it's clear that the freshman class isn't exceedingly strong. In fact, there's a significant drop-off from the top two of the Watch -- but that's not to shortchange the impact of a lot of other players. What's intriguing about Keldon Johnson is how solid he's been -- and he's stayed in our top five for almost the entire season here at the Watch -- and yet he's probably the most "anonymous" UK standout ever under Calipari. This is an oddity, considering UK is now a top-10 again, has lost just three times and hasn't been out of the news cycle. But Johnson has been somewhat quietly going about his business. His first big moment is probably coming in February. East Carolina's on the decline, having lost five-straight, but Jayden Gardner's stock is rising. Fresh off 35-point and 27-point performances last week, he followed it up with a bit of a disappointing eight-point, four-rebound outing against AAC bully Houston. Then he went off, scoring 15 points and grabbing 15 rebounds in 35 minutes against South Florida. From top to bottom on the stat sheet and off it, Gardner remains one of the most productive freshmen this season. Lamine Diane is dominating in obscurity, but he's still easily cracking our top 10. We've been tracking nearly 50 of the best freshmen in college hoops this season, and Diane still rates top-five among them in points, rebounds and blocks. Northridge -- or CSUN, as the locals call it -- is 9-12 and has a 3-2 record in the Big West. Coby White has shot UNC back into the top 10 of the polls -- and himself squarely into the top 10 of the Watch. Against No. 10 Virginia Tech last week he scored 27 points, the second-most of his green career. He also made five of his 11 3-point attempts, dropped six dimes and grabbed seven rebounds, all marks above his season averages. After putting up a goose egg in the stat sheet in points scored, steals and assists in Michigan's first loss of the season to Wisconsin last week, Ignas Brazdeikis returned to production with a very nice week. Against Minnesota he went just 4-of-18 from the floor, but was active in attacking the basket on both ends, drawing out 11 free-throw attempts, making 11, and grabbing 11 boards. Against Indiana on Friday, he found success from the floor by knocking down 8-of-12 shots and 3-of-5 from beyond the arc in a 20-point, seven-rebound night. With the way he's scored and paced the top-5 Wolverines, he's entrenched himself in this list all season. Charles Bassey doesn't have the boom-or-bust capability Trae Young had last season or Antoine Davis does this season, but he's been a steady 15-and-10 all season for Western Kentucky. This week he averaged 15 points and 12.5 rebounds per game as the Hilltoppers went 1-1, and Bassey missed only four shots during that stint. His eFG% rates among the highest of freshmen in the NCAA all season, and he's been a dominant rim-protector, too.